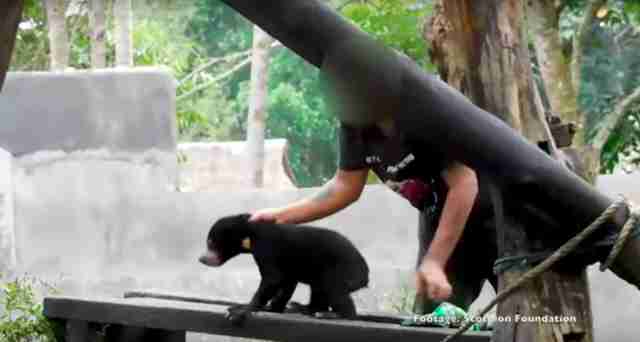 In a sad video, a man carries a baby sun bear by the scruff of her neck, plunking her down upon a wooden bench. When the baby bear tries to scamper away, the man roughly grabs her and holds her down, wiping her down with a cloth. 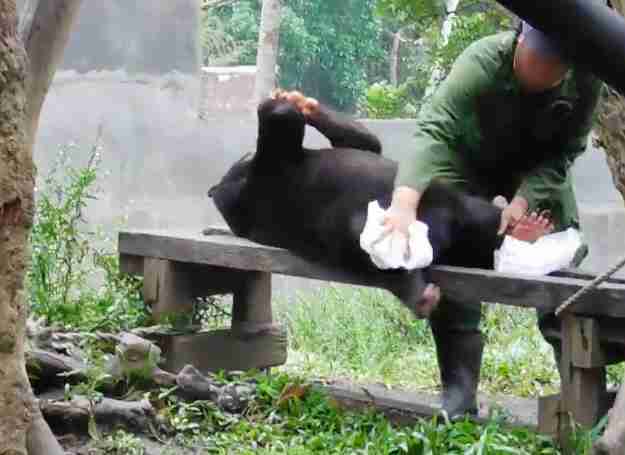 In another scene, the bear’s mother lies on the same bench, but she doesn’t try to escape — she appears sluggish and lethargic as a man cleans her with a cloth as well. The bears in the video are a mother-daughter duo named Ajib and Marsha. 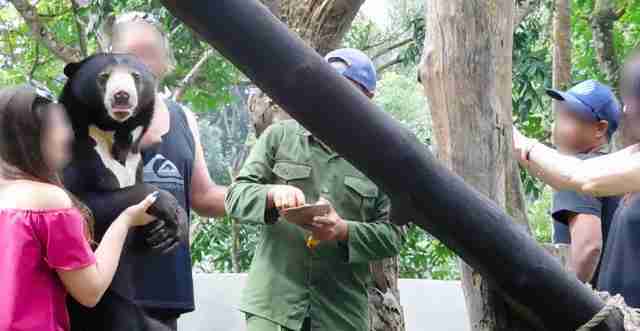 Ajib used to live in the wild, according to Dave Neale, animal welfare director for Animals Asia. But now Ajib resides in captivity with her baby, where they both spend their days posing with tourists for photographs. This past July, Marison Guciano, director for investigations for Scorpion Foundation, witnessed these scenes when he visited the Bali Elephant Camp, which is run by a company called True Bali Experience in Bali, Indonesia. 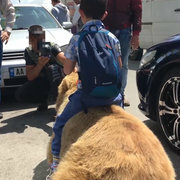 “Some Western tourists (as seen in the recording) then pay for tickets to pose with the bear and her baby,” Guciano said, adding that each paying person or group would get about 20 minutes to spend with the bears. When Neale viewed the footage, he wasn’t surprised — tourist operations in Southeast Asia regularly offer photo opportunities with wild animals, he explained. 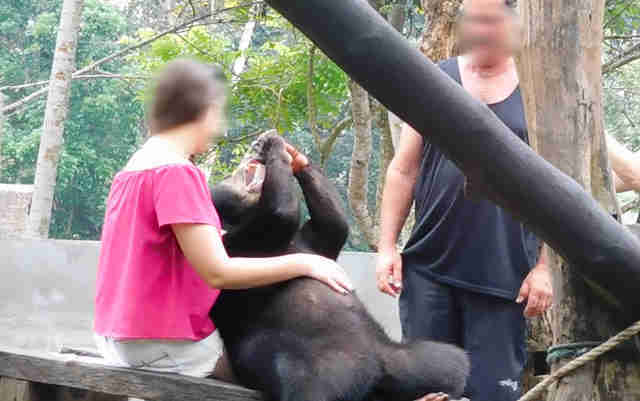 But this doesn’t make it right — Neale believes that the bears are miserable in captivity, especially Ajib, who would remember what it’s like to be wild. “To be exploited in this way and used for this kind of amusement is quite sad,” Neale said. Neale is also concerned about what goes on behind the scenes. In addition to Ajib and Marsha, there’s a male bear — probably the father of Marsha. But he’s kept inside a crate all day long, according to Guciano. True Bali Experience could not be immediately reached for comment. While a sanctuary would be ideal, Neale noted that most sanctuaries are already overcrowded in Indonesia and that might not be a realistic option. But at the very least, the park can take care to house the bears properly, he said. “I think the best situation is that they actually invest some resources into providing them with a better enclosure than where they are,” Neale said. To help these bears, as well as other animals being used for selfies in Southeast Asia, you can sign this petition. 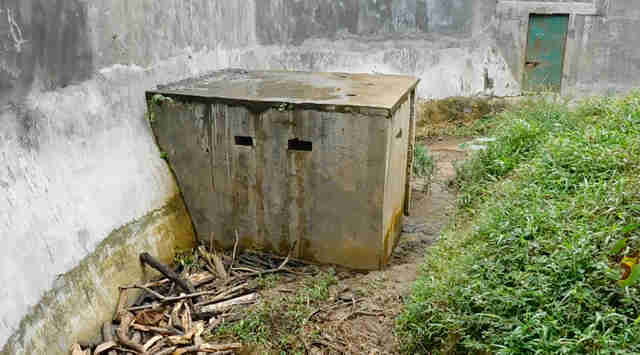 You can also support investigations like these by making a donation to the Scorpion Monitoring Group or Animals Asia.